Accessibility is seen as the fourth key driver of urban competitiveness in the State of European Cities Report (2007) along with innovation, entrepreneurship and talent. Connectivity refers to communication and exchange of goods, people and information between cities and incorporates the aspect of accessibility (transportation) and access to information infrastructure. According to the report, the cities with score higher on an index of accessibility also tend to have higher economic performance. Improving internal and external accessibility is a cross-cutting issue throughout the VASAB LTP. According to the Territorial Cohesion Perspective of the BSR in 2030, ”the BSR is a place with well- balanced setup of metropolitan centres, which act as the global and the BSR gateways, and small and medium-sized cities and towns, which secure a high quality of life for their residents in both urban and rural areas” (VASAB LTP 2010, p.12). Generally, southern cities in the BSR (from Bremen and Hamburg in Germany, via Berlin towards Upper Silesia in Poland) enjoy higher urban connectivity compared to cities in other parts of the BSR, due to their proximity to other destinations in Central and Western Europe. Capital cities normally have the highest accessibility compared to other cities in the same country. 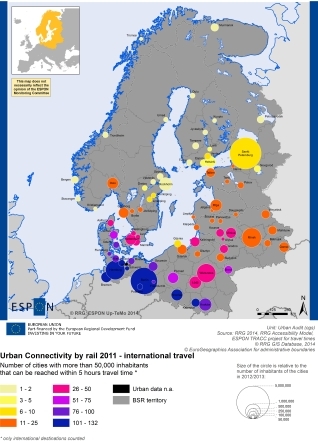 Cities in Belarus and Northern Scandinavia are only loosely embedded with other cities, due to their long distances and poorer transport networks. Interestingly, the spatial patterns between road and rail are quite similar, only cities in Belarus and Eastern Poland suffer from poor train services compared to car. 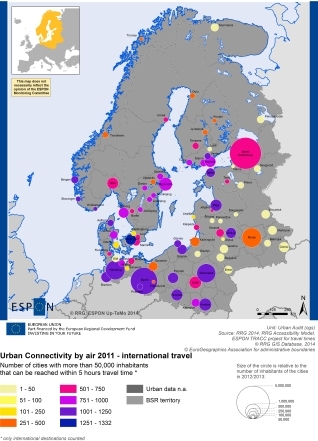 International air services boosts connectivity of many cities (compared to domestic air, but also compared to the other modes), adding a wide range of destinations for many cities in Scandinavia and in the Baltic States; however, most of these connections by air are going through the airport hubs of the respective capitals.